Key West is only 4 miles long but it has over 50 live music venues. Many venues have three shifts of music a day. This equates to over 300 gigs per week and over 16,000 gigs per year in Key West. This vibrant community is a story all its own, and is perfectly captured by De Palma in The Soul of Key West. 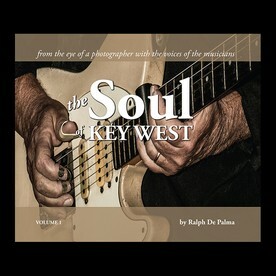 Volume I includes 46 interviews of Key West musicians. Well over 200 hundred photographs were selected from a collection of 4500. It's a 104 page anthology of the Key West music scene as told by the musicians. Their stories are the true description of the lives of professional musicians. This compact island has the most unique music scene of any city in the US and possibly the world. The music scene is supported totally by the equally unique audience with no cover charges at any of the music clubs. On any night in Key West a short walk of a few blocks and one can listen to some of the best original music, played by world class musicians, in unique open venues, for the price of a cold drink. Volume 2 has taken two years to complete and includes a thorough analysis of the Key West music scene that tries to answer the question "How did all this music happen in this tiny island community?" Another 65 wonderful musicians, vocalist, and a dancer were included. The pages include over 160 photos, a Key West legend or two, two special music scene members, even Jimmy Buffet's most famous "Roadie", several tributes and a Memoriam to former Key West musicians that are no longer with us. 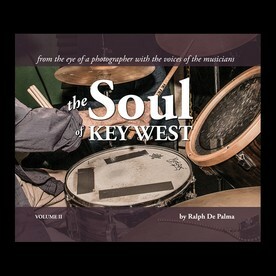 The Soul of Key West, Volume 2 is a very comprehensive guide to our world class music scene.